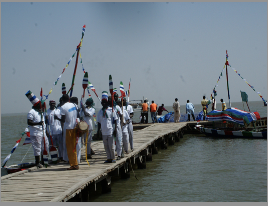 The Ministry of Tourism and Culture of The Gambia, “The Smiling Coast of Africa” has announced the dates of May 6-13, 2016 as being the period when the 12th edition of the International Roots Homecoming Festival will be celebrated. The 12th edition of the festival comes barely a year after the country marked its Golden Jubilee, and is expected to be the biggest ever. The festival seeks to build bridges between Africans in the Diaspora who look up to Africa as their ancestral homeland and those on the continent for mutual cooperation and development. Last year, Dr. Julius Garvey the son of the late Pan Africanist, The Rt. Honorable Marcus Mosiah Garvey, as well as, a distinguished professor Emeritus from the University of California, Dr. Runoko Rashidi attended and participated as panelists during the symposium on Pan Africanism. The well-known Jamaican Poet and Roots Festival cultural griot, Mutabaruka, alongside the Jamaican Reggae artist, Sizzla Kalonji, the Festival’s Cultural Ambassador, were among a host of other artists and personalities from across Britain, the USA and the Caribbean. Highlights of the 2016 Festival, which is expected to be even bigger, include a carnival of Gambian and West African masks and masquerades, punctuated with traditional rhythmic African dances and music, visit to the infamous Kunta Kinte Island and Fort, which played a part in the trans-Atlantic Slave Trade, A symposium on Pan Africanism, A Rites of Passage Ceremony affording Diaspora participants the opportunity to live the experience and be adopted by a traditional Gambian family, Music-both traditional and modern as well as an African Gala Dinner showcasing the best in Gambian-African Cuisine. There are a host of other stimulating experiences awaiting the eager culture & heritage explorer! The Ministry of Tourism and Culture invites all people of African descent and all persons committed to the well being of Africans and the development of Africa, to come home to The Gambia and participate in The 12th edition of the International Roots Festival which is a historical, cultural and educational event, scheduled to take place in The Gambia from the Friday 6th - Friday 13th May 2016. Roots 2016 commemorates the enforced enslavement and transportation of millions of Africans to the Americas and the Caribbean Islands. Africans and friends of Africa from the Diaspora are presented with a unique opportunity to attend and participate in The International Roots Festival 2016. The Ministry of Tourism and Culture invites all people of African descent and all persons committed to the well being of Africans and the development of Africa, to come home to The Gambia and participate in the 11th edition of the International Roots Festival which is a historical, cultural and educational event, scheduled to take place in The Gambia from the 9th – 17th May 2014.